Sensational, unbeaten (14-0 with 6 wins by KO), Light Welterweight prospect Dean ‘Irish Lightning’ Byrne left his London base earlier today to travel back to Dublin, where he is set to fight a yet to be named opponent at the Dolphil promotions event at the Citywest Hotel on Sunday the 30th January 2011. 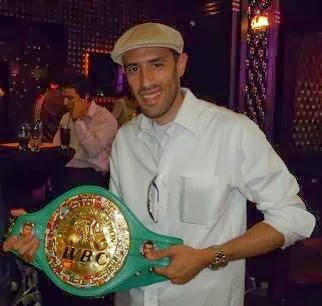 Dean is managed and trained in Los Angeles, USA by ‘Trainer of the Year’ Freddie Roach at his Wild Card Gym, where he regularly sparred with Manny Pacquiao and Amir Khan amongst others, but since returning to London has been training with Barry Smith at Johnny Eames’ Ultrachem TKO Boxing Gym in Canning Town. The globetrotting ‘Irish Lightning’, who during his career has already fought in Australia, America and Ireland, has already proved his championship credentials, having won the Australian Light Welterweight title on just his fifth outing, is intent on making his mark in Europe and to challenge for either an Irish or British title in the near future. Following his final bruising sparring session, with Freddie Turner at the Ultrachem TKO Gym, The “Irish Lightning’ took the time to talk briefly on his career and the upcoming Dublin fight. “I’ve no idea of my opponent as yet. I’m sure he’ll be a decent opponent as it’s a Dolphil Promotions show on the 30th January. "I’m ready, the last couple of weeks I’ve been training at the Ultrachem TKO Gym in London where Barry Smith has been helping me out a lot. "I’ve been sparring with everyone up at the gym. Freddie Turner, just got out after five rounds sparring with Freddie. I’ve been sparring Kash (Akaash Bhatia) and Nate (Nathan Weiss) and all the boys up here. "I’m 14 and 0 with six knockouts, I’ve been a pro five years now, had two years of inactivity due to injury. I’m ready to fight now and have no injuries. I’m feeling strong and I’m ready to step up to another level and get some title shots. "Freddie Roach is my trainer/manager, when I’m in England ticking over, Barry helps me out a lot and keeps me in good shape, and that’s what you need to do is keep ticking over. As a professional person, not just a fighter, you have to be always ticking over and being in good shape. As mentioned previously, Dean’s coach in London is Ultrachem TKO’s upcoming young trainer Barry Smith, who has worked with many of Johnny Eames’ world class stable. Barry, who has coached Dean for his last two Dublin fights, spoke of his talented charge. “Man, I think he’s brilliant, he’s a great prospect and has a great future ahead of him. He’s got all the tools. He just does it, he’s a delight to work with. He trains hard, he wants it. He’s always in the gym, he enjoys his boxing. "You don’t have to tell him to do anything, because he just does it, you don’t have to moan at him he just does it. He’s really keen and dedicated. He’s just a great all round fighter. "He’s without doubt one of the best fighters I’ve seen. He will go all the way. I have no doubts about it, he can go all the way. He lives the life. He doesn’t go out celebrating after a fight, two days after he’s back in the gym. Brilliant. "He makes it easy to work with him, he’s just so professional and he knows what he wants and he knows where he’s going and that’s real good. "When he’s in America he has one of the best trainers in the World (Freddie Roach) and over here he’s at the TKO Gym with myself. What more can I say, he’s dedicated and is a great fighter. Final word though has to go to the ‘Irish Lightning’, who had a bit of interesting news for his British fans. “I’ve been talking to a couple of people and am hoping in the future to get a fight in England so you might see a bit of ‘Irish Lightning’ here in 2011. So, all you UK fans out there you may get to see the Irish Lightning strike up a storm in the UK soon. Dean ‘Irish Lightning’ Byrne against a yet to be named opponent will be at the Dolphil Promotions show at the Citywest Hotel in Dublin on Sunday 30th January 2010. Also featured on the show are Paulie Hyland, Robbie Long, Ian Tims, Michael Sweeney, Oisin Fagan, Anthony Fitzgerald, Mark Heffron amongst others. 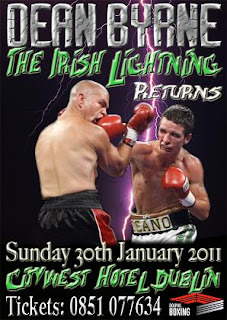 For tickets, call Dean ‘The Irish Lightning’ Byrne on 0851 077634.